Historically, manufacturers were almost solely focused on reducing costs by applying automation and analytics to engineering, R&D, manufacturing operations, and quality organizations. 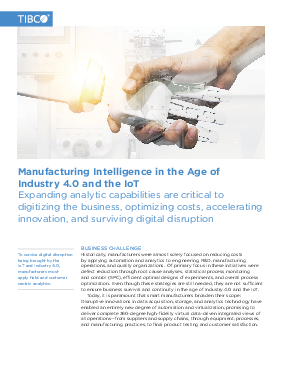 Even though the strategies used within these areas are still needed, they are not sufficient to ensure business survival and continuity in the age of Industry 4.0 and the IoT. Today, it is paramount that smart manufacturers broaden their scope because disruptive innovations in data acquisition, storage, and analytics technology have enabled an entirely new degree of automation and virtualization, promising a complete 360-degree high-fidelity virtual data-driven integrated views of all operations—from suppliers and supply chains, through equipment, processes, and manufacturing practices, to final product testing and customer satisfaction.